It's that time of year again - we always have a fabulous dinner with our friends at the start of the year. We get together to make a large tasting menu, in total, 13 dishes. This year, we had the dinner a little early. and we were also a couple short since Dagmar and her husband has recently moved. We hope they'll join us again next year! We had a lot of ideas for themes but in the end, decided not to have a theme at all. It turned out to be a varied meal, and everything was delicious. 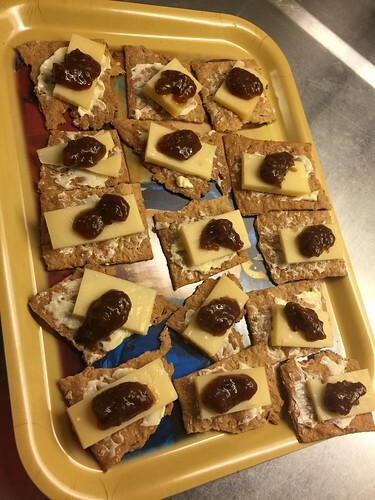 Each couple made four dishes, and I added a small snack and a drink, as usual. 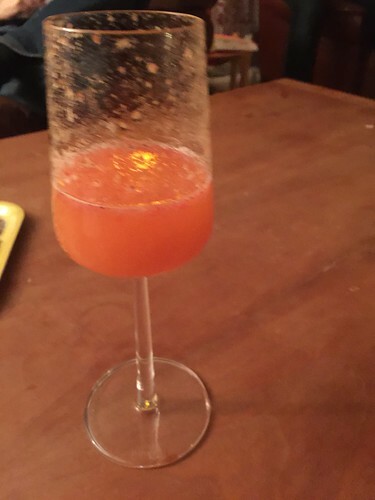 Our first course was a drink - Bellini Frutti which was basically sparkling wine with a purée of peaches, pink grapefruit and strawberries - and a caraway-spiced crisp bread topped with Dutch Prima Donna cheese and a fig compote. 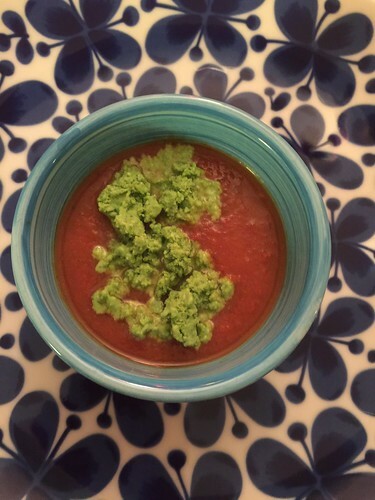 Next came a spicy gazpacho with a mint ice cream. Different and very fun! Erika and Micke made a lovely (but hard to photograph) rösti from sunchokes and potatoes. 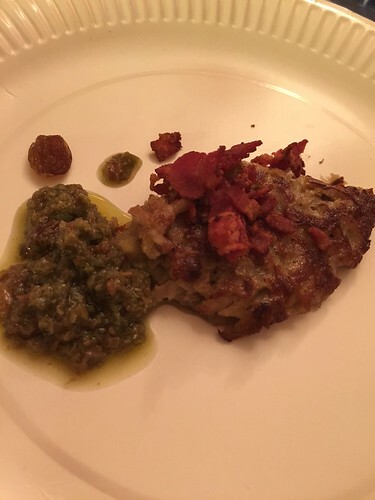 It was served with crisp bacon, raisins and a caper sauce. I loved it. 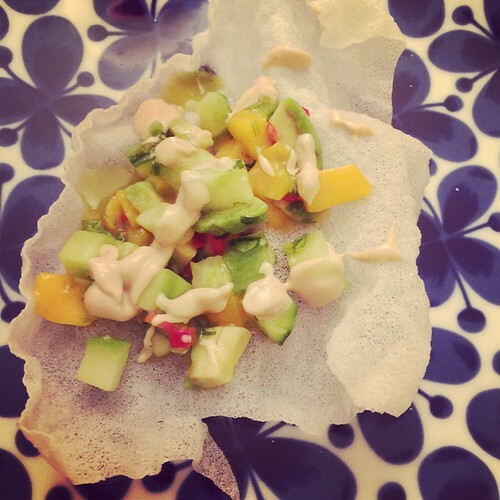 My starter was rice crisps - you simply deep fry spring roll wrappers, very fun! - with a mango salsa. I was planning to put lobster on top of this but it smelled a little funky so I didn't dare. It was certainly good on its own! It's also topped with a little bit of soy mayonnaise. Micke and Erika made what might have been my favorite dish this evening. 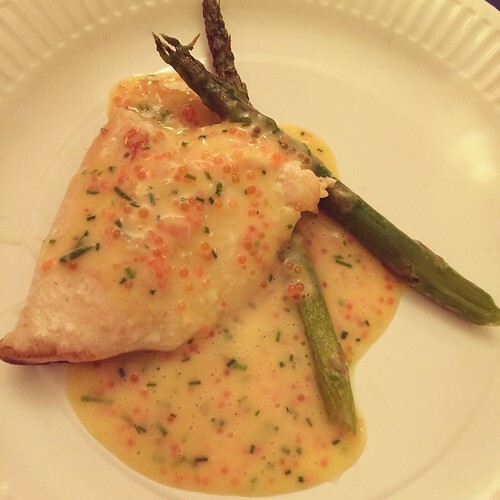 Arctic char with a beurre blanc and asparagus. 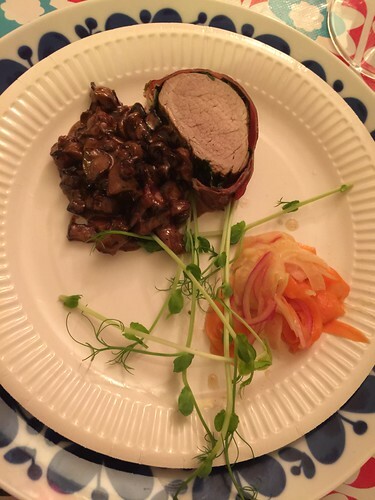 For my main course, I wrapped pork tenderloin in spinach and Parma Ham, and served it with fantastic cognac-laced mushrooms and a lightly pickled salad. 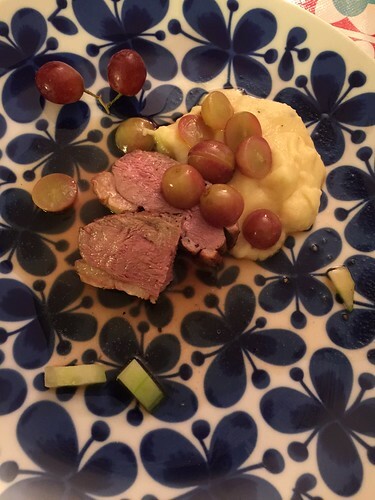 We also had duck, with a sweet grape sauce and a garlicky potato mash. 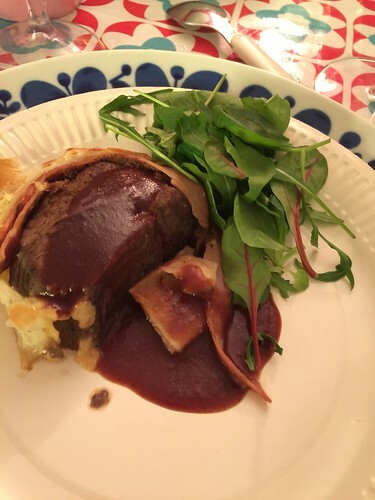 The final main course was a classic Beef Wellington from Lena. It was really pretty so I wish I had a better photo of it. The sauce was fantastic! 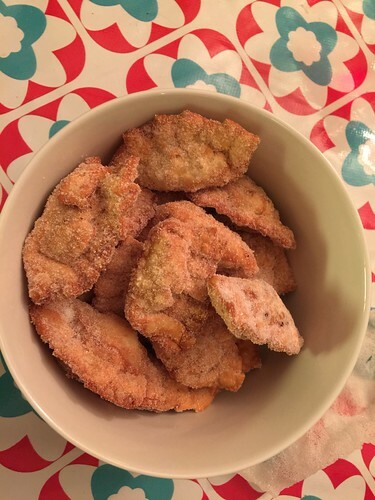 This dish - deep-fried dumplings - was so weird I first wondered if it had been included in the cookbook (Dumplings all day wong by Lee Ann Wong) as a joke. The filling has white chocolate, wasabi and pretzels and on its own, it was pretty horrible. But as it turned out, it was really good! The dumplings took a lot of work, since the pretzels are sharp and prone to poke little holes, so I did a lot of patching. This was so good it should be illegal. 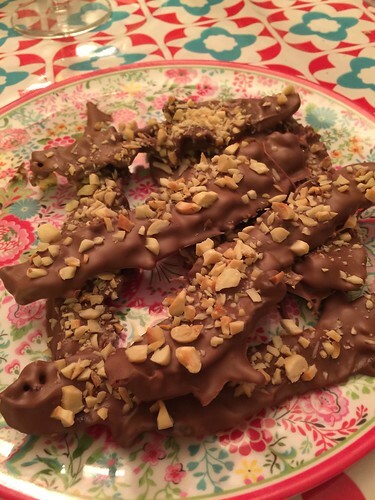 Chocolate dipped bacon with toasted almonds. Try this! 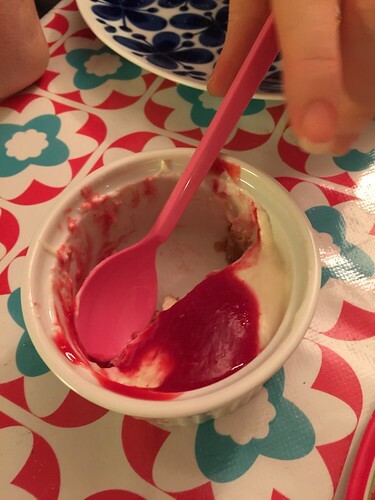 Erika and Micke made individual cheesecakes with raspberry coulis, awesome! 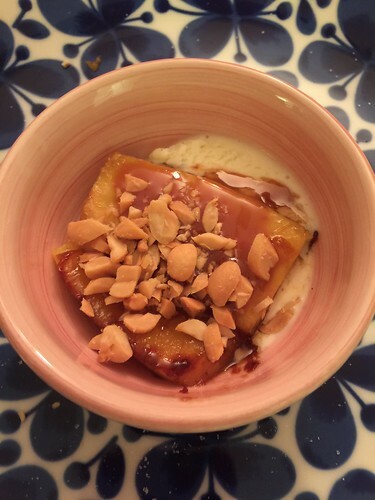 My own dessert was a repeat - fried pineapple with caramel sauce, vanilla ice cream and salted peanuts. Yum! Finally, our very last dish. 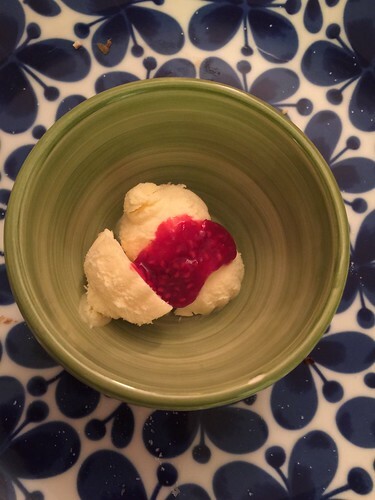 Limoncello parfait with a raspberry coulis. The perfect to end to our wonderful meal. Want to look at earlier years? I always love seeing what you have for this special dinner. Must be a fun evening!